Today, your office is where you are: at home, at the airport, at a caf�. Customers, partners and contractors need access to your business from anywhere. And uncertainties ranging from natural disasters, pandemics and terrorism to fires, power outages and hard drive crashes increase the need for secure remote access to mission-critical resources. 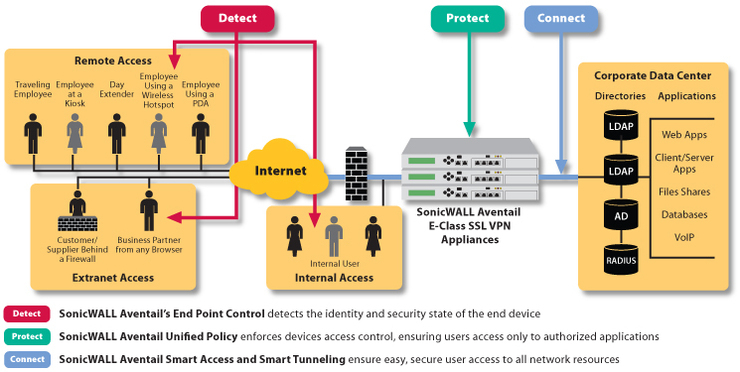 SonicWALL SSL VPNs offer secure remote access to end points beyond IT control, without the costly overhead needed to deploy and maintain per-seat clients. SonicWALL SSL VPN delivers easy, scalable SSL VPN solutions to fit every organization, from small- to mid-sized businesses to the largest global enterprise. *Virtual Assist is a licensed add-on module and available only for SSL-VPN 2000 and SSL-VPN 4000 appliances. SonicWALL offers the world�s number-one-selling SSL VPN product line. SonicWALL SSL VPN solutions can be configured to provide users with easy-to-use, secure and clientless remote access to a broad range of resources on the corporate network. The SonicWALL SSL-VPN 4000, SSL-VPN 2000 and SSL-VPN 200 appliances provide easy, affordable secure remote access for small- to mid-sized businesses. You can optionally add on SonicWALL� Virtual Assist to SSL-VPN 4000 and SSL-VPN 2000 deployments to provide easy and secure help desk support for remote end point devices via the Web. Extending our leadership in the SSL VPN market, SonicWALL has added the award-winning Aventail SSL VPN product line to our E-Class appliances. Our best-of-breed SonicWALL� Aventail� E-Class EX-2500, EX-1600 and EX-750 SSL VPN appliances deliver secure remote access to the most resources from the most end point locations. Aventail was named in the Leaders Quadrant in the SSL VPN Magic Quadrant Report from Gartner, considered to be the leading analyst firm covering the SSL VPN industry. SonicWALL Aventail E-Class SSL VPNs can boost workforce productivity, ease manageability and enhance your enterprise network security. SonicWALL SSL VPN appliances integrate seamlessly into any network topology and can be easily deployed alongside any third-party firewall as a secure remote access solution. This enables IT administrators to leverage the existing network infrastructure without the need to purchase additional hardware. When deployed alongside a SonicWALL PRO or TZ appliance, you gain enhanced security and Unified Threat Management (UTM) protection.